Once upon a time, natural lawn care was but the province of crackpots and eccentrics. Today, the whole nation is going green. Herbicide runoffs from lawn care products have found their way into local ponds and streams where they’ve encouraged algae overgrowth. Herbicides kill earthworms – almost 90% of them with some products – and earthworms are the architects of our soil. Without our knowledge, herbicides can be easily tracked into kitchens and homes by humans and pets alike where they can represent a very significant health hazard. Herbicides may produce perfect-looking lawns but they may be putting our lawn’s health ahead of our own and that of the rest of the environment. The truth? Low-impact environmental approaches to lawn care are never going to get you the same expanse of emerald green perfection as you’d get using herbicides. But how does dealing with a few clumps of clover and perhaps a couple of dandelions compare with poisoning the planet? Read on for some helpful hints on natural lawn care, and learn how to do your part. 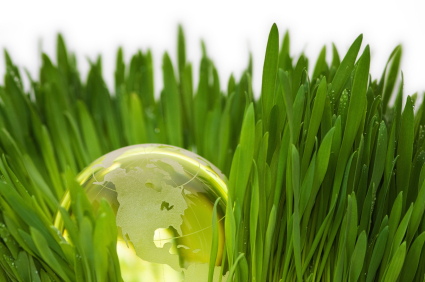 Healthy grass is grass that’s in harmony with its environment. When grass is healthy, it’s more resistant to pests. A healthy lawn depends upon adequately aerated soil with an adequate amount of nitrogen, goodly amounts of organic material and lots of helpful, beneficial organisms. This will enable your lawn to become naturally resistant to weeds. Going natural means you will be relying upon lime, sulfur, organic fertilizers, and biodegradable herbicides and pesticides rather than on synthetic products. It doesn’t mean that you will never use synthetic pesticides – but you won’t use them routinely. Natural lawn care is a holistic game plan, rather than a problem-and-solution oriented strategy. Grass loves soil that’s rich in nitrogen, and there’s a very easy way to tell if your soil has enough. Look at the uninvited plants – okay, weeds – growing growing in your grass. Do they include a lot of clover, medic, wild lupins and vetch? These plants are called legumes, and one of their distinguishing characteristics is that they can get their nitrogen straight from the air. If you see a lot of legumes in your grass it’s a sure sign that your soil is nitrogen depleted. Your lawn needs a fertilizer! When you dig up a shovel full of earth, do you see some earthworms? This is a good sign: earthworms are the best indicator of healthy, well-aerated soil. Different plants prefer soils of different acidities. Chemists call acidities “pH.” Dandelions prefer a soil pH of 7.5; most grass, on the other hand, thrives best at a soil pH of 6.5. If you keep your soil pH at 6.5, then your lawn has the competitive advantage. Though gardening stores sell pH kits, your best bet may be to have your lawn tested professionally. Grass grows best in aerated soils that have a mix of clay, silt and sand. If there’s too much clay or it’s heavily compacted for some other reason, you may need to rent an aerator or hire a lawn service to perform the task. If there’s too much sand, you may need to add compost and other organic matter that will degrade into humus, which will help retain water and nutrients. Soil that’s overly acidic may require a sprinkle of lime; soil that’s too basic requires sulfur. Before you plant your lawn, fertilize your soil. While over-applying natural fertilizer will not burn your lawn the same way over-applying a synthetic fertilizer will, it can lead to excessive leaf and shoot development and poor root development; too little fertilizer, on the other hand, will slow grass growth leading to the kind of thinning turf that’s optimal for weed growth. In order to calibrate the correct amount of fertilizer your lawn requires, you will have to measure your lawn. There are many kinds of organic fertilizers on the market. If you don’t have a favorite, ask you’re the garden center where you rent your fertilizer spreader for a recommendation. Yes, it’s critical to use a mechanical fertilizer spreader, at least the first time: this will enable you to calibrate your equipment to apply just the right amount of fertilizer. The best times to fertilize your soil is following aeration, either in the spring or in the fall. Apply your organic fertilizer three times for the best results. Like all plants, grasses are adapted to particular climates and conditions. You may love the look of Bermuda grass, but if you live in a shady spot in the northeast, this is not the lawn grass for you: Bermuda grass thins quickly in shade and quickly grows dormant when the temperature starts to cool in the fall. Pick a grass seed that’s locally adapted to your region and your growing conditions. Grass seeds germinate best when they’re in contact with the soil. Spread a quarter of an inch of organic compost over your newly seeded lawn to facilitate soil contact and enrich your soil. Water in small amounts three or four times a day to keep the soil moist while your grass seedlings are germinating. The thicker your lawn, the less room there will be for weeds to push through. If your lawn begins to show signs of thinning, reseed using half the amount of seed you used to start the lawn. Once your lawn begins to grow, cut back on using the hose. A good soaking encourages your grass to develop deep, healthy root systems; overwatering, however, can encourages fungal growth and shallow roots that predispose your grass to injury and disease. Thorough but infrequent waterings produce the best results. If you’re a lover of close-cropped lawns, you may need to accustom yourself to a new standard: natural lawns are healthiest when they’re between three and four inches tall with one exception – later in the growing season just before your lawn becomes dormant for the Winter, cut it back to two inches to discourage mold from building up during the colder months. With a little care and attention, you can have a healthy, great looking lawn that is not any kind of threat to the enviornment – so everybody wins! I would like to know about a lawn care that uses beer, mouth wash, dish soap, soda and ammonia as the ingredients. Knowing how much of each would be helpful.